The Vickaryous Law Firm supports several community initiatives that help low-income families, the elderly, and veterans. One such charity is Rebuilding Together Orlando (RTO) that provides critical repairs, accessibility modifications and energy efficient upgrades to homes and community centers at no cost to service recipients. Last weekend Touchstone Energy Cooperatives joined RTO to improve the homes and lives of 30 Tangelo Park households in just 8 hours. More than 100 volunteers from electric cooperatives across the country, who attended an annual meeting in Orlando, completed their seventh annual community service project to improve this local neighborhood. captains Chandra Capobianco (Florida Paints), Chantell King (Volunteers for Community Impact), Freddy and Raquel Jara-Almonte (retired US Air Force veteran), Daniel Carter (Construction Manager and Realtor), Tori McIntyre (Lockheed Strategic Planner) Board members Bob Gordon and George Landis, assisted 30 households, four of which received intensive home repairs such as flooring, weatherization, accessibility modifications, painting and landscaping. 26 homes received RTO’s Safe and Healthy Housing Kit, a small install-kit that increases the overall safety, security and health of the household and its occupants. These kits focus on making small additions and modifications that make a big difference in the life of the residents and their families. Safe and Healthy items that were installed included smoke detectors, fire extinguishers, bath mats, and security lights. A variety of services also provided to the homeowner included a home assessment, dryer vents cleaning, and checking of air filters. 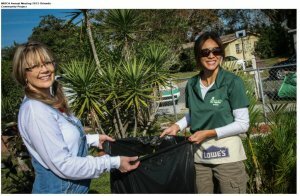 For further information regarding RTO programs, sponsorship and volunteer opportunities visit Rebuilding Together Orlando. Appreciation comes from RTO’s Executive Director Ed Green: “Thank you to everyone who volunteered their time to help make this project a success. And what a success it was!” as well as Laura Cook, Member Communications of Touchtone Energy Cooperatives: “It was an amazing day and I am proud to be part of our cooperative family. From all of us at Touchstone Energy, thank you for your hard work and all the smiles along the way.” Watch the video. What a team!